By definition, gravel grinder races are meant to be tough. The long miles, big days in the saddle, and often brutal terrain can break down even the most seasoned rider. There’s no denying the allure of these long days for the diehard endurance junkie. Gravel grinders push the physical and mental boundaries of every participant, and if you’re lucky enough to finish you always come back wanting more. So, what do you need to do to prepare if this sounds like fun to you? The training for a gravel race should be approached differently than your typical road century or gran fondo. These are the things you should keep in mind to get grinder ready in three months. The first step, which should come as no surprise, is that you need to ride big miles. Substantial time in the saddle is the first and most important step in your preparation. Allow for four to six weeks of gradually building up your overall volume. The focus during this segment should not be on speed, but time on your bike. The goal during this time period is to be comfortable with six to eight hour rides over varied terrain. It’s also a good idea to stack consecutive long days to mimic the wear and tear that the race itself will offer up. I like to recommend using these rides as an opportunity to dial in your gear as well as your nutrition strategy. One of the most important things you can do during these long endurance rides is to develop a nutrition strategy that works for you. Mastering the amount of water, carbohydrates, protein, etc. you will need should be done during training so there’s no guesswork come race day. This is also the time to figure out what works in terms of tire selection, carrying nutrition, and gear selection. Often overlooked, but just as important, is the mental component of gravel races. Use the long hours on the bike to become mentally tough. This will help you tremendously when the miles start to blur together after 10 plus hours on the bike. After you’ve built up a substantial base, and you feel comfortable with long rides and back to back to back efforts, it’s time to start to integrate some speed work. Your aerobic and anaerobic systems work in concert on these long rides to provide the necessary endurance, as well as the strength and power to climb, sprint, and battle the wind. At the completion of your base period, dedicate two to three weeks focused on integrating speed work into your training. Continue to keep the overall volume high, but instead of riding at endurance pace, include some sprints and long climbs throughout your ride. Incorporate shorter, maximum effort sprints of up to one minute, as well as longer threshold and sub-threshold efforts lasting 5 to 15 minutes. It’s during this phase that some dedicated workouts on a stationary trainer can be beneficial. These focused efforts allow you to hone in on specific areas and keep your volume and duration goals on track. Specificity is key here, as you’ll want to integrate components of your goal race into your training. If your course consists of a lot of climbing, then perform long and short hill repeats and include plenty of elevation gain on your long rides. If it’s a course with rolling terrain and short “punchy” climbs, then sprints and interval training will best prepare you. This period is meant to bring all of the pieces together and culminate in race day preparedness. You will want to begin your taper approximately three weeks out from your goal race. During your taper you will gradually decrease the intensity and duration of your workouts. I still recommend including a few dedicated speed and strength workouts, but these should be treated as maintenance rides. The goal in these final weeks is to maintain your fitness and prepare your body for the main event. A two week taper is usually sufficient in shedding residual training stress while not allowing your fitness to decrease at to rapid a rate. The week leading up to your event should be easy. A few easy endurance rides of one to two hours along with stretching, foam rolling, proper nutrition, and hydration should be the course of action. Don’t try to squeeze in any more workouts. Feel confident that the work has been done, and that you’re ready and able to tackle your grinder. The day before your event it’s a good idea to do a short ride lasting 45 minutes to an hour and a half with some high cadence drills and short bursts. This type of ride will help to flush any lactic acid build up from your down week and get your body primed and ready to go. 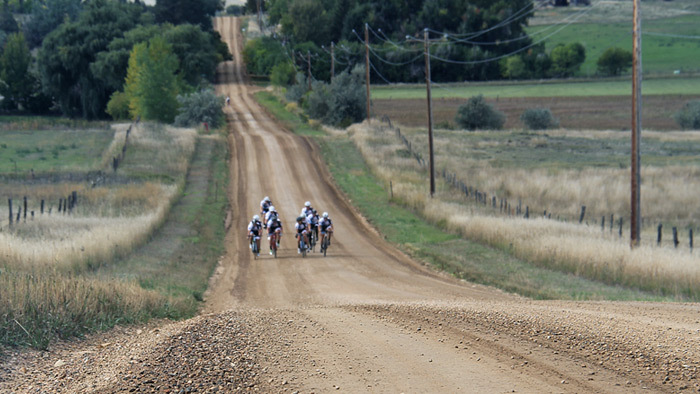 The gravel grind, while an intimidating event, is something that can be obtainable and approachable for most riders. Keeping your training on track is key to properly preparing for these big events. Take the appropriate amount of time to log long days in the saddle, and then move to more specific workouts. Don’t forget to focus on the details. Gear selection, hydration, nutrition, and mental preparation are as big a part of your training as the actual rides. Remember to think critically about the specific details of your event, and incorporate components of your race into your training. Go ahead and let yourself fall victim to the allure of the gravel, you can be race ready in three months!